Park's latest version of the derailleur alignment guide is stronger, more accurate and fits a wider range of wheel sizes than ever. The DAG-2.2 measures derailleur hangers then can be used to straighten a misaligned hanger until it measures perfectly – letting your rear derailleur shift accurately again. Adjusts to fit 20” to 29+” wheels. Made from heavy-gauge, chrome-plated steel with an upgraded inner shaft for added strength. Replaceable threaded tip. Tighter tolerances over DAG-2. Improved clearance and reach over DAG-2 to fit more frame/hanger combos including low-clearance thru-axle derailleur hangers. I've been riding various bikes for over 50 years, but never realized how much derailleur misalignment effected shifting. Once I read online and saw the videos, I had to have this tool. What a difference it made in the shifting on my recumbent tadpole trike! It'll pay for itself quickly in saved service trips to the LBS and trying to fix problems by buying new (unneeded) drivetrain parts. Now I'm going to check derailleur alignment every so often and offer to check my friends' bikes. Wonderful, well made tool! Typical Parks high quality, and they have many good videos on YouTube to walk you through doing your own repairs. I was struggling to adjust the rear derailleur on one of my bikes to get clean shifts across the whole range, and realized that the derailleur was not looking properly aligned. The DAG 2.2 confirmed my suspicions, and allowed me to coax the hanger back into alignment. Problem solved. I checked my other bikes, and ended up adjusting another as well. The tool itself is functional, rather than elegant, but it gets the job done at a decent price. This is one of those tools you might not need often, but indispensible when you do. Solved a pesky shifting problem on a mtn bike. Was having shifting problems and could not get them corrected. After being told about hanger alignment i purchased the DAG 2.2. I found the hanger out of alignment. Aligned my hanger and readjusted the derailleur then my shifting problems went away. A great tool at a reasonable price. Sturdy tool that does exactly what it's intended to do. But go easy, lots of leverage can make it easy to break a badly bent hanger. The differences between this and the original DAG that I've owned for decades are not huge. In fact. I made an extension for the old tool that duplicates most of the functionality of the new one. The DAG-2.2 does seem a bit tighter and I'm happy with it, but the difference is subtle. If I hadn't needed a second tool, I would have been perfectly happy with the modified DAG. I was having issues with my rear derailleur shifting correctly and this tool got it straightened it quickly! I keep my bikes clean and do regular maintenance on the drivetrain. I'm careful that I don't lean the bikes on the derailleur side. That being said, for some unknown reason, I've bent the derailleur hanger 3 times this year. At $30 a pop at the bike shop to straightened the hanger, it was a no-brainer to invest in this tool. 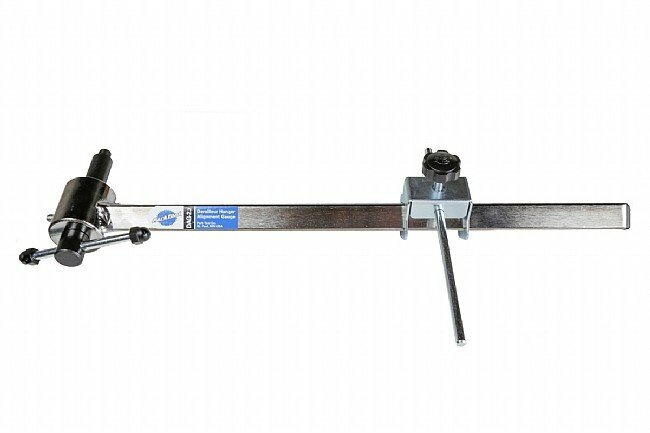 The Park Tool Derailleur alignment tool is extremely easy to use. I was able to straightened the hanger in less than 10 minutes. I recommend this tool. It has paid for itself already this year. Another mandatory tool if you want to maintain your bicycles yourself. Good tool. Well built and very sturdy. With thinner rear cassette spacing and lighter weight drivetrains, this is just a must have tool for anyone who does their own maintenance. Park makes good quality tools at a reasonable price.